Domestic beers just a dollar and imports not much more. College specials, a rowdy crowd and loud music, everyone coming home smelling like smoke. A girl being dragged through a horrible time and relationship, feeling stuck and sadly at one point accepting that she didn’t deserve anything more. She’d probably marry the jerk, she would probably have jobs that didn’t bring her fulfillment and joy. It’s a sad thing when a human being accepts anything less than happiness for themselves because they think that’s what they deserve so why keep looking? What’s the point? And then…he walked in. A boy with a nice tan, genuine smile and a sweet Southern accent…but not country. Just Southern enough. So cute, so handsome. SO UNBELIEVABLY POLITE. I got please, thank you, etc. You’re coming up to this little tiki hut to a college bartender and using manners and I just don’t even know what kind of a rare creature you are, but I kind of like you already without knowing a thing! A year goes by and like the pin I saw on Pinterest last night…….I JUST WOKE UP AND DECIDED I WAS DONE WITH THE BAD STUFF. It was that simple. I was so sick of being hungover emotionally, literally, going day to day with no goals or agenda, depressed, feeling sorry for myself. The sky was the bluest sky I’d seen in years, because I was quite literally seeing life differently on this particular day. It was time to break up with the bad boyfriend and find that cute guy who kept coming to see me at the bar. And this is where I just will always love and appreciate Facebook…I wrote on his “wall” and we made plans to hang out. I could write for days about the rest- but it’s history. We knew that first date. We knew where it was going. We told each other we were in love after two weeks. Everyone knew this was the real deal. So– after trying to figure it out for a long time, our tattoos came to mind and I think we kind of need to thank Katie Durski because she just rebranded my business with the very element I now have on my body matching my husband, haha! 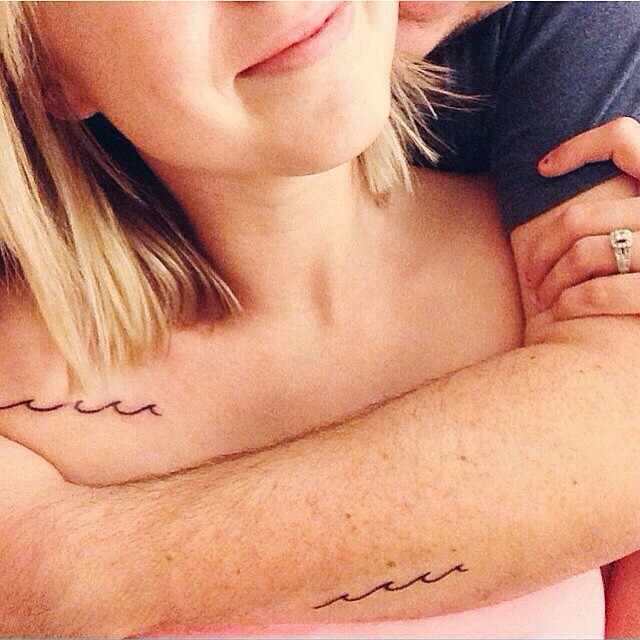 We went back and forth on words, numbers, quotes…and then when we thought of just getting four waves for each of us to represent our family love and peace at home by the sea…it worked. Simple, strong, meaningful and darn cute. The sea is our home. We ache for summer days and jumping in that salty water with salty waves in our hair all day long camped out whether it’s Kitty Hawk, Rodanthe or anywhere in our beautiful home on the Banks. But regardless..we find ourselves pulled like a magnet to the sea constantly and what better way to represent our little troop but with gentle, CONNECTED and flowing waves?! I’m in love. And for those of you little sillies who have been asking? Yes– we can “add a wave” easily because you all know another baby is coming at some point hahaha! at golden hour on that sunny warm Sunday of ours! Previous articleSessionsRyan + Rachel | A Little SNOW in OBX! This is beautiful! I adore the love that your family has for each other! I love your blogs and how much meaning you put behind what you write. It could be because I just watched a sappy video, but this post makes me so happy. I can relate to your life by the sea as Chad and I are dreaming of the day we can move to the coast. Those 4 waves reverberate in me and make me smile knowing that God has you right where He wants you and when that happens, He is able to do BIG things for and with you! !